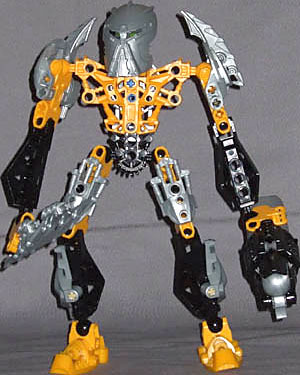 For much of Bionicle's history, the Kanohi Ignika, the "Mask of Life," was the Macguffin that everyone was charging around desperately trying to find, capture, wield, or keep someone else from getting their biomechanical paws on. It's no surprise it eventually got sick of it and decided to take matters into its own hands. Step one: get some hands. He's probably more determined to just not be passed around like the village bike, but points for effort. Still, when you notice that half of 2008's Bionicles were sold in canisters shaped like this guy's head, you can see for yourself he's not an insignificant character. In taking humanoid (or Bioniclenoid) form, the Ignika hasn't deviated far from the classic Toa body frame - I guess if it's your first time as a corporeal being, you don't want to be singled out, and incarnating with seven arms and a 20-foot-long invertebrate torso probably wouldn't have helped much in getting the other Toa to accept the new guy among their ranks - they didn't initially realise Ignika was the mask, you see, they thought he was some guy wearing the mask. Thus Toa Ignika fits right in with the other Toa of the Phantoka and Mistika conflicts (to recap: roughly speaking, ground and air arenas of the final war for the planet), with a yellow (gold) and black body, adorned with silver armour. Since he's a boxed set, not a canister set with a more limited parts allocation, Ignika gets rather a lot of silver armour - well, it makes sense that the Toa of Life should stand out a bit, and he probably gave himself a nifty body in hopes of scoring with Toa Gali. He'd been stuck as an inanimate mask for 100,000 years, remember, I think it's fair to assume that getting his end away was a priority by this point. Besides the Toa-standard thigh and upper arm plates (which are sleeker versions of Gali's - maybe he hoped they'd be a talking point: "Hi, I see we've got similar armour, wanna come back to my place and see my Ki-Nui? "), he's also sporting kind of half-greaves on his lower legs, and blades attached to the backs of his shoulders. He also has a kind of "backpack" unit, in silver, to support a Matoran connector piece, but so far as I can tell from the website he's never been advertised as joining up with one of the little guys. The all-powerful Kanohi Ignika mask (which is kind of like saying "ATM machine," but I'd rather not get bogged down in Bionicle jargon) is replicated in sharp detail - so far as I can tell, since the only other place I saw it was on the canister lids. The use of the smooth shoulder plates and add-on blades is a smart choice, since between the two of them they mimic the mask's streamlined profile, and the sharp ridges set into it, making the head look at home on the body. The sword and Midak are standard pieces, but the Midak - according to the instructions, anyway - attaches sideways to the "hand," which lifts it up a little higher and is generally more useful for when Ignika mounts up and goes surfing. Which brings us to the skyboard - yep, the Toa of Life made himself a surfer dude, he's determined to get laid. The board is 11½" long, and basically consists of two parts: the rear, including the bell-shaped engine and a pair of swivelling wings, and the front, which is a black sheath containing as many wicked-looking blades as could be stuck in there. It's a bit more of a build than the average Toa, but I didn't find it really very satisfying from a builder's point of view - I like what Bionicles are when you're done with them, but when it comes to building I like to start with a table full of parts and a big instruction book, and not be done until I've gone through several hours and a considerable amount of complicated construction. The board is a bit... well, simple. The wings tick me off a bit, as well - they're attached via a single plug each, leaving them free to swivel, but there's no mechanism, or even a catch, to hold them in place either open or closed. Indeed, the starboard wing, which has a slightly weak plug on mine, has a tendency to slip open a little bit just in the course of being picked up and moved around, which is irritating when you're building these things to display - I imagine it'd be a bit of a pest if you were playing with it too. 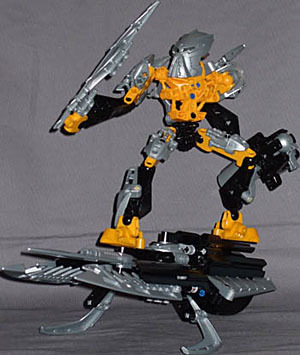 On the plus side, Toa Ignika stands nice and stable on it, and with or without him the board's very steady resting on its engine and side-blades, leaving its nose up in the air for a nice flying effect. So that's Toa Ignika - a bit odd, really. 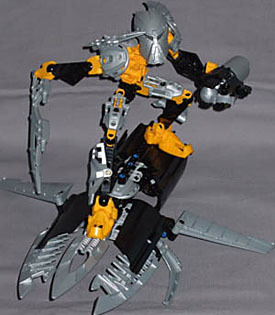 As you may have gathered from the incoherent rambling that characterizes my Bionicle reviews, as opposed to yo's breezy discussions of the history of Karda Mata Nui, I don't really know a hell of a lot about these things, but even I know the Kanohi Ignika when I see it - and if you'd told me, without seeing this, it was going to create a body and be a warrior by itself, I'd have expected something a bit more, well, grand. You know, wrath-of-god type stuff. Toa Ignika is a respectable Toa-scale figure, and the skyboard, though not the greatest Bionivehicle, is pretty decent all considered, but you're just left with a bit of a feeling of "That's it?"